Author Notes: My New Year’s decision regarding food is to eat more fresh fish. Although it’s harder to find then meat it’s worth while going the extra mile to buy good fresh fish, preferably not farmed. For this recipe I chose fresh salmon that I seasoned with Red Peppercorns, lime juice and fresh grated ginger. I baked them in the oven in Papillotes so it cooked in it’s own juices rather then in water or broth. Very simple and healthy, really quick to make and doesn’t make any mess. I served it on a bed of sautéed spinach. Happy New Year! We loved the varied grid of seasonings, all so simple to assemble and each contributing generous amounts of flavor. The final touch — a sprinkling of fresh cream over the gently cooked salmon — is not to be missed. Take 2 large pieces of aluminium foil (or parchment paper) the same length and put one on top of the other, both shiny sides outside. Roll together on the length the aluminium foil together to make a seam and tighten it. Roll this seam 2 more times and press on it so the 2 pieces of aluminium foil are tight together. Gently open the aluminium foil. Press on the seam which is now in the middle and you have a double width aluminium piece of foil that can take all the pieces inside. Turn the aluminium so the seam is perpendicular to you and you have a wide aluminium piece. Fold it in half and lightly press so you know where the middle is. Clean the salmon fillets of all bones and if you prefer take the skin. Otherwise when putting the fish on the aluminium put it skin down. Season the salmon fillets with a pinch of salt, freshly ground Sichuan pepper, lime juice and grated ginger. Place the aluminium foil on a baking tray so that the bottom half is sitting on the tray. Drizzle the olive oil on the aluminium half nearer to you, place the salmon with the seasoning and add the red peppercorns that you lightly crush with your hands. Place the dill on top of each salmon fillet and fold the top half of the aluminium towards you. Go round the aluminium folding together the 2 foils (top and bottom) 2 or 3 times so you completely seal all around. Bake in the oven around 10 minutes, depending how thick the fish fillets are. The papillote, if closed tightly, should blow up with the steam that the water in the fish let’s out. Discard the dill, serve one fillet per person on a bed of sautéed vegetables for example spinach. 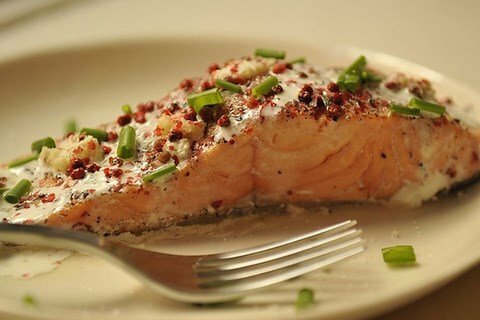 Place on top of each salmon fillet 1 teaspoon of thick cream, sprinkle with some chopped chives and a little Fleur de Sel.